People say this all the time, but your baby will grow up before you know it. In fact, it's almost amazing how much your child will develop during the first few years. A growth chart puts this rapid change into numbers - on average, babies almost triple in weight by the time they turn two years old. Your baby's development isn't just physical. Some rapid changes are happening in the mind, too. As a newborn, your child will generally occupy one of three zones: resting, ready and rebooting. Understanding these zones helps you address your baby's needs and keeps you from reaching your wit's end. Of course, your child's brain is getting stronger with each passing moment and every new experience. This isn't about learning for learning's sake - it's about survival, and understanding brain development can help you raise a smart child. Pretty soon, your child will start to roll over on her own. Eventually, she'll start crawling, and soon she'll be ready to walk. You can help by providing boxes or low-sitting furniture for your toddler to grab on to or a safe area for her to explore. You can also use fun games to encourage your little ones to take her first few steps. 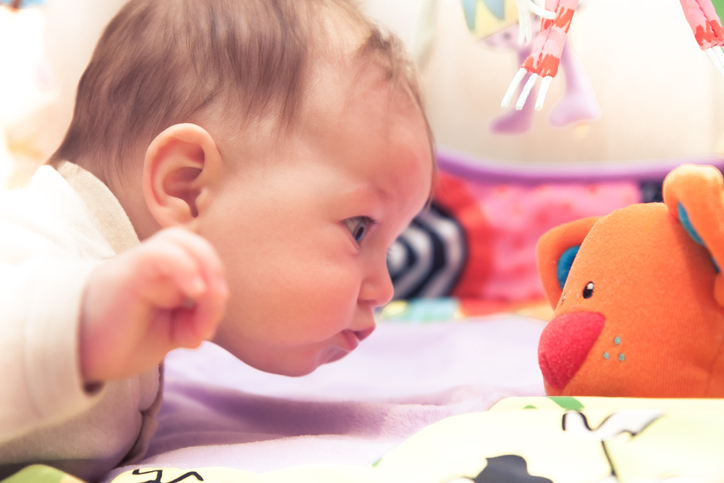 Raising a child isn't without it's frustrations, but seeing your little one develop is a magical time. Be sure to cherish these moments and support your baby's growth when and where you can.